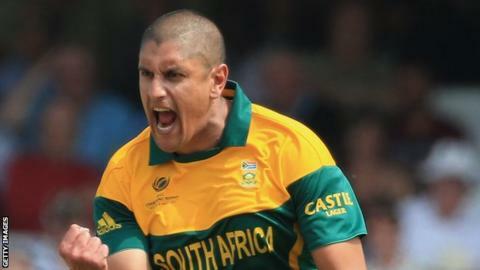 Northants will sign South Africa all-rounder Rory Kleinveldt for the 2014 season, subject to a successful visa application. The 31-year-old became a main target after the overseas signing of Jackson Bird fell through because of injury. Kleinveldt has played four Tests, 10 one-day internationals and six Twenty20s for South Africa but has not played for the Proteas since July 2013. Northants tried to sign Kleinveldt last season but withdrew their offer. "We're very confident we've got the no objections certificate from the South African Cricket Board which was the main stumbling block," head coach David Ripley told BBC Radio Northampton. "We've just got to go through the visa process now and we're hopeful that Rory will be with us for the second game of the season. "We had one or two other plates in the air if Rory couldn't come but it was looking tougher with the IPL going on and other international commitments. "He's an all round cricketer and can contribute in our one-day format as well as our Championship format." The Cape Town-born seamer has agreed a contract which will see him play in eight County Championship and 10 Twenty20 games. Kleinveldt's arrival will helped cover the loss of one-day captain Alex Wakely, who is injured for the season, and all-rounder David Willey, who will miss the start of the campaign.